Personal finance is the financial management which an individual or a family unit performs to budget, save, and spend monetary resources over time, taking into account various financial risks and future life events. When planning personal finances, the individual would consider the suitability to his or her needs of a range of banking products (checking, savings accounts, credit cards and consumer loans) or investment (stock market, bonds, mutual funds) and insurance (life insurance, health insurance, disability insurance) products or participation and monitoring of individual- or employer-sponsored retirement plans, social security benefits, and income tax management. Assessment: A person's financial situation is assessed by compiling simplified versions of financial statements including balance sheets and income statements. A personal balance sheet lists the values of personal assets (e.g., car, house, clothes, stocks, bank account), along with personal liabilities (e.g., credit card debt, bank loan, mortgage). A personal income statement lists personal income and expenses. Goal setting: Having multiple goals is common, including a mix of short- and long-term goals. For example, a long-term goal would be to "retire at age 65 with a personal net worth of $1,000,000," while a short-term goal would be to "save up for a new computer in the next month." Setting financial goals helps to direct financial planning. Goal setting is done with an objective to meet specific financial requirements. Plan creation: The financial plan details how to accomplish the goals. It could include, for example, reducing unnecessary expenses, increasing the employment income, or investing in the stock market. Execution: Execution of a financial plan often requires discipline and perseverance. Many people obtain assistance from professionals such as accountants, financial planners, investment advisers, and lawyers. Reviewing and reassessment: As time passes, the financial plan is reviewed for possible adjustments or reassessments. Typical goals that most adults and young adults have are paying off credit card/student loan/housing/car loan debt, investing for retirement, investing for college costs for children, paying medical expenses. TV appearances with Saul Simon. Click here see a list of TV appearances with Saul Simon. 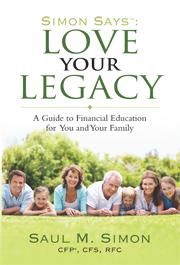 If you have a Financial Legacy to leave to your heirs, "Simon Says: Love Your Legacy" was written for you.